The Union are coming into this match after a loss to Real Salt Lake, snapping a run of four wins that saw them surge from deep the Eastern Conference basement to now being four points below the line. Philly has given up only two goals in their last six matches, thanks in large part to the stiffening of their back line. Center-back pairing Jack Elliot and Oguchi Onyewu (hello, throwback) have played extraordinarily well on defense, backed of course by standout ‘keeper Andre Blake. Also revamped is the Union attack, spearheaded by the red-hot CJ Sapong, who has four goals in his last five matches (though three of them came against one team – the Red Bulls – at the beginning of May). Jim Curtin also owes some credit to his wingers, Chris Pontius and Fafa Picault, the former with four assists in five matches, and the latter with two goals in the last four after spending the early part of the season with Bethlehem Steel. Also an emerging danger is midfielder Haris Medunjanin, making a name for himself in the Union win streak as a playmaker and midfield engine for the club with two assists and two goals in their last four. 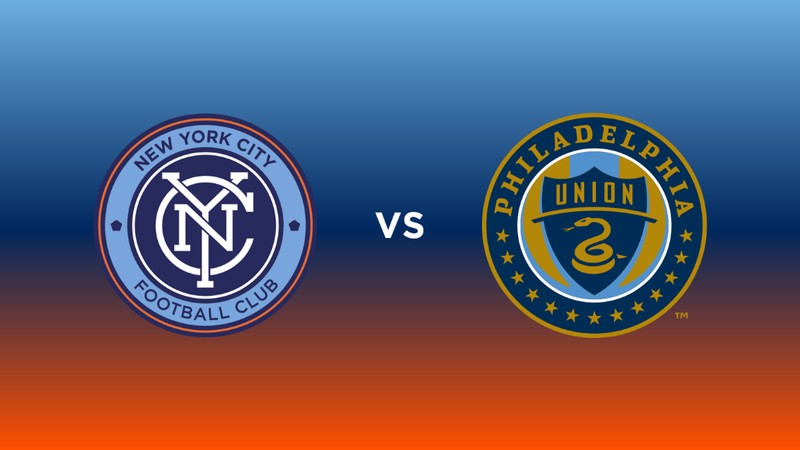 New York City are coming off an extremely disappointing draw-that-felt-like-a-loss after coughing up a late goal to New England Wednesday night. Consistency, focus and concentration were all words touched on by Patrick Vieira after that match, and it will be important to see the club finish strong against yet another Eastern Conference team. City will have most of their A1 starters available for this match – the notable absences being Yangel Herrera and Rodney Wallace – both away on international duty. The good news, however, is the return of Ronald Matarrita from the injured reserve. Matarrita had been finding a groove prior to his injury, grabbing two assists in his last three matches. The chemistry he had been developing with the likes of Maxi Moralez and Wallace was proving fruitful, and hopefully we can see some of that coming back with him. Alex Ring will also return to the lineup after serving his accumulation suspension and should stabilize our defense in the midfield. The question of who will replace Wallace for this match is an interesting one. Miguel Camargo certainly made his case for more minutes on Wednesday, netting the go-ahead goal shortly after being subbed on against New England. Also waiting in the wings is first-rounder Jon Lewis who hasn’t seen much time yet, but might get some substitute minutes if the situation allows for it. There is also always the prospect of Tommy McNamara returning to the wing, where he saw success a season ago. Keys for City will be to pressure the Union wingers and keep them from getting clean balls into the box for Sapong. Wednesday night, we saw Ben Sweat fail to close down Kelyn Rowe and launch an un-pressured assist that ended up being the final goal. Philadelphia has a lethal attack, and the limited space on the Yankee Stadium pitch will force them to modify their gameplan and make them easier to defend, but poor positioning or marking will lead to goals. Maxime Chanot and Alex Callens will have to win a lot of aerial duels to keep Sapong off the scoresheet. The Union play well once they find their rhythm, and it will be up to the likes of Ring and Mikey Lopez to make sure that rhythm doesn’t get established. When pressured and down, Philly can play a desperate game, making it easy to take advantage and pour on. The key is to not play them like a bottom-dweller team. NYCFC needs to return to their early-season style of dictating the game, disrupting the opponents attack and winning the lion’s share of possession.